Did you realize you could save a ton of money building your own camping gear? With free camping gear plans, you can build your own table and chairs, camp shower, barbeque and camp stove, as well as a portable shed that breaks down for moving. If you love to spend time in the great outdoors, there is no need for roughing it when you spend a little time creating these useful and easy to build projects that will make your camping trip relaxing and enjoyable. Choose camping gear plans to suit your needs, whether it is a collapsible picnic table, camp chairs or mini-cabin to build on your own property. Customize the plans to suit your needs, following the easy-to-follow instructions and tips you will find that are included with the plans. Materials lists and suggestions make the projects great for families and novice builders. Here are instructions and diagrams for building a two piece camp chair that is easy to take apart and put back together. 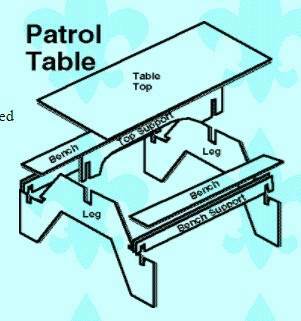 Build a camp table that can store away flat, be easily transported and is simple to put together when needed. 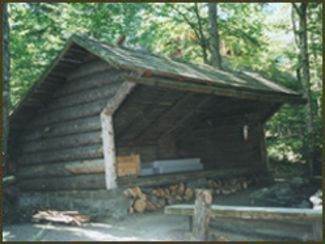 With this plan you can build a trail shelter that the whole family can enjoy when roughing it in the great outdoors. Here is a plan for a portable hunting cabin that you can take apart and set up where needed for warmth and shelter from outdoor elements. Keep your camp area up and off the ground by building this portable platform for your camping trips.